Clacton & Heywood by-election betting update. That’s a pretty big bet for a by-election. Of course, Labour should hold this comfortably but UKIP and the BNP combined got about 10% of the vote in 2010 and UKIP did very well in local council elections there this year. With UKIP about to hold its conference and rumours of an second Tory MP defecting imminently, I don’t think an upset is impossible. Clacton, on the other hand, doesn’t look like it will be a very interesting betting contest as far as the winner goes. Douglas Carswell is now 1/25 to win the seat for UKIP. We’ve now got a market on what vote share he will achieve on October 9th. 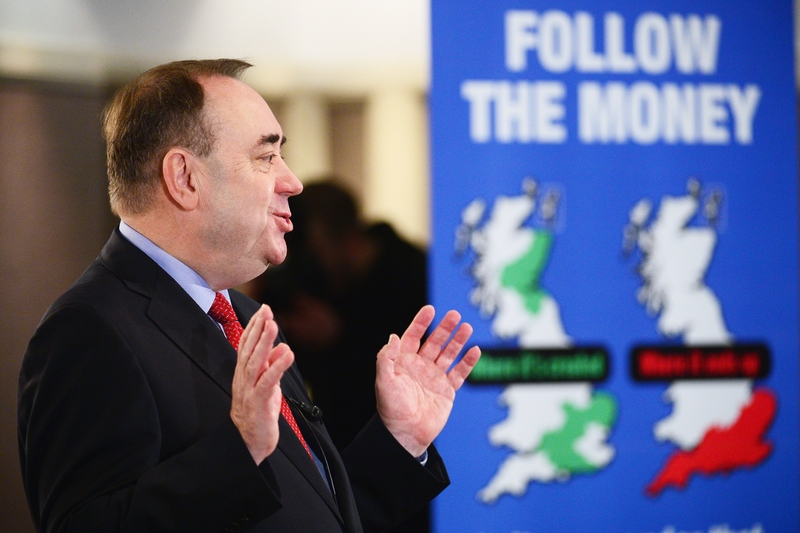 Could the SNP win 25 seats at Westminster? Ladbrokes now makes SNP favourites to unseat Danny Alexander in Inverness. Despite a fairly comprehensive defeat for the nationalists in last week’s indyref, we now think the SNP might make some significant progress in next May’s general election. Their seat line (which is our central forecast for the number of constituencies won) has moved up from 6.5 to 9.5; the SNP currently hold six of Scotland’s 59 seats. In pretty much every seat in Scotland, their odds have been cut quite significantly, and below are their top 25 prospects along with our estimate of their chances of winning each seat, based on Ladbrokes current odds in each constituency. The SNP are now favourites to win Argyll & Bute, a seat in which they actually came fourth last time. 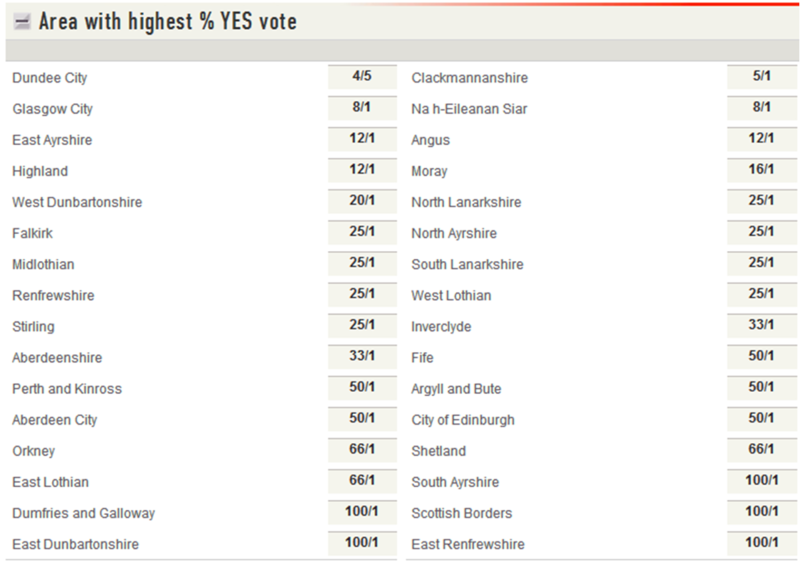 We also now make them favourites to turn over Danny Alexander’s sizeable majority in Inverness. He could be the highest profile cabinet casualty in 2015. Their hopes rest on being able to appeal to a sizeable chunk of the 45% who voted YES last week. I expect a large number of those will revert to type and not bother voting at the general election. However, if the SNPs dramatic increase in membership since last Thursday is anything to go by, they must stand a good chance of causing Labour and the Liberal Democrats some big problems across the country. The SNP is now so big it can be seen from space. It’s official: This was the biggest political betting event of all time. Previously dominated by UK general elections and US Presidential races, the indyref turned out to be bigger than any of those. From the huge interest in our betting shops in Scotland to the staggering amounts matched on the exchanges, it’s clear that this has smashed all previous numbers. I think it was something to do with it being an issue that people felt much more strongly about than party politics along with the central proposition being a simple binary YES/NO choice that caused it. The fact that the race was reasonably close in the final stages was a big help too, although it was never anywhere near being the “toss-up” that the media portrayed. The biggest price you could ever have got NO at with Ladbrokes was the 4/9 that it briefly hit in the wake of the YouGov poll showing YES in the lead, when YES hit it’s all time low of 7/4. The betting on the YES vote percentage was also a huge heat for us, the amazing feature of which was the non-stop support for it going above 55%, even before the polls tightened in the last few weeks. That would have resulted in the worst loss ever for Ladbrokes on a non-sports market, but it never looked very likely. We got lucky with the vote dipping below 45%; the 40-45% band was the optimal result for us and was never bigger than 3/1 at any stage in the last 12 months. We also got a break with the turnout betting, having completely underestimated the chances of it being as high as it was. In the end, we just escaped a very nasty hit that would have occurred had it gone over 85%. The punters who shrewdly took advantage of our initial 16/1 quote about it being over 85% have had one of the best value losing political bets ever. Dundee rewarded favourite backers in the top YES percentage area betting, always having been odds-on. Spare a thought for the people who backed Inverclyde to go YES at 3/1, who lost out by under 100 votes. Another good value loser. The main political betting lesson to take out of the indyref was a familiar one; anecdotal “on the ground” evidence is a very poor substitute for a dispassionate examination of the polls and the political science. Unsurprisingly, posters in windows turned out to be a poor predictor of the final result. Ladbrokes will have odds available on the referendum throughout the night until the result is declared (or I fall asleep). If this is close, we’ll likely all be waiting for Glasgow. The latest Ladbrokes prices there make YES and NO joint favourites at 5/6. 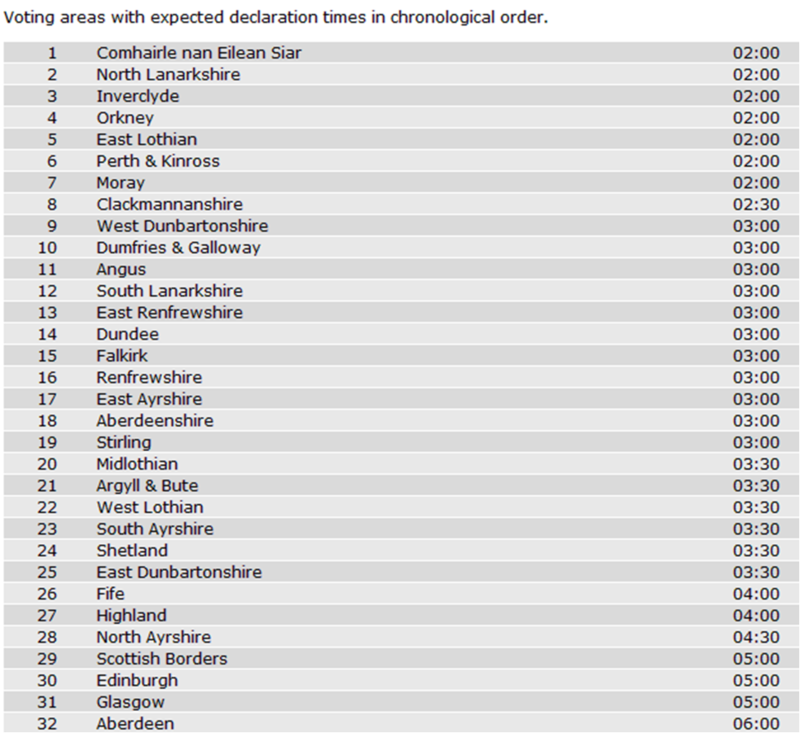 If Na h-Eileanan Siar (the Western isles) do declare first, we won’t be over-reacting to the result. It could easily prove to be totally atypical to the rest of the country, although our betting suggests it is more likely to go YES. If NO wins here, then I’d be fairly certain that Scotland is staying in the UK. A YES win with over 53% or so would indicate that the nationalists are on course to go very close. Clackmannanshire at 2.30 could also be interesting – we rate this as the second most likely area to go YES after Dundee, so if they can’t win here, that will be a very poor showing. As things stand, a YES vote will be a very expensive outcome for Ladbrokes. 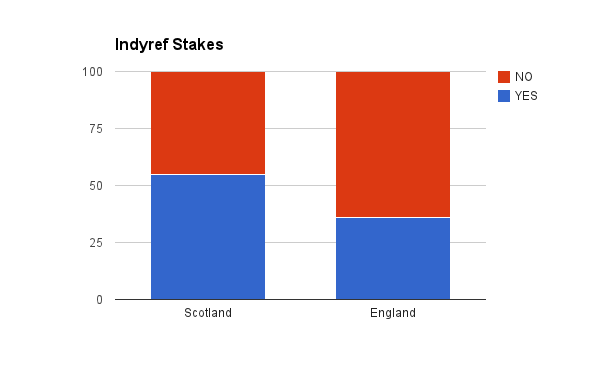 The money today is overwhelmingly for independence, although the odds remain unchanged at 7/2. Our best outcome would be a YES vote of between 40 & 45%, preferably with a turnout under 80%. We can now say with certainty that this has been the biggest UK political betting event of all time. You can find all of the latest odds here. I’ve been in Scotland for a couple of days. Most people who don’t follow the betting were very surprised that there was such a big discrepancy between the odds for YES and NO, given that the media are telling us that this is variously a “coin toss”, “on a knife-edge” or “too close to call”. If these polls are an accurate picture of the electorate, then the nationalists’ best chance is to convert enough of those Don’t Knows to YES. The final column shows the percentage of undecideds who would have to go YES to pull them level. In my opinion, it is exceedingly unlikely that they will be able to achieve those numbers. In fact, political science tells us that it is much more likely that the opposite will happen and the undecideds will break for NO. It’s worth pointing out that the improvement in the YES figures over the last two weeks seem largely to be a movement from DK into the YES column. So perhaps something different is going on in this referendum. The other main assumption that needs to be questioned is whether the pollsters really are accurately measuring opinion, given the unique nature of this vote. For a nationalist viewpoint on this, head for James Kelly’s blog. On the other hand are there enough “shy unionists” to make a difference in favour of the NO campaign when it comes to the vote? Check out Stephen Fisher’s excellent review of all of these matters. Can YES still win? Of course, but it’s unlikely unless the pollsters have got this very wrong. This certainly isn’t a coin toss and, if forced to make a prediction, I think we’ll see a reasonably comfortable NO win by around 55-45. You can find all of the latest betting here. Reported Panelbase figures are also 52-48 to NO. Significantly, with DKs included, it’s 50-45-5. So YES would need 100% of the undecideds to draw level. After four polls on Saturday, the betting markets remained largely unchanged, continuing to give YES something under a 25% chance of victory. The last Saturday of the campaign saw the familiar pattern of Scottish based customers being more likely to back YES, but only just; English punters continued to side more strongly with a NO vote. I’m flying up to Edinburgh today, for the Ladbrokes Referendum Race at Musselburgh tomorrow, and to spend a day in the city on Tuesday. Probably standing outside some Ladbrokes shops with some odds scrawled on a blackboard. That’s right. Ladbrokes and Musselburgh races are joining forces to sort this referendum out in equine form. A special two horse match race with Yes We Can battling it out against Neigh Thanks. We’re running the race at 1.40 on Monday, before the race meeting proper kicks off. It’s free to get in; I’ll be there!